Here are a couple of photos to accompany the case study of UNITA in my article, "Rebel Diplomacy in Civil War." As mentioned in the article, in 1989, U.S. President George H.W. Bush welcomed UNITA President Jonas Savimbi in the Oval Office. Below is a photo of a gift the rebel leader presented to Bush on this occasion, now displayed at the Bush Presidential Museum in College Station, TX. The gold plate at the bottom reads: "Winds of Democracy and Freedom are Sweeping All Over the World." Of course, we know what Savimbi chose to do for Angolan democracy three years later -- he rejected Angolan national elections results and helped plunge the country back to war. Thereafter, the United States, a staunch ally of UNITA during the Cold War, distanced itself from the rebel group. 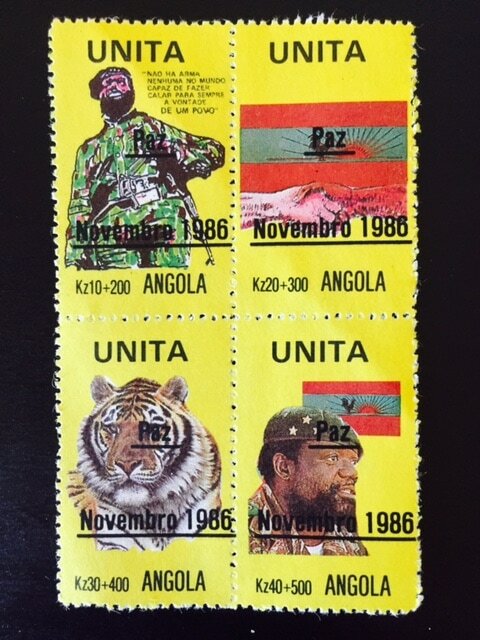 As part of its self-legitimation project, UNITA went so far as to run its own mail system and issue its own internationally recognized stamps, shown below (depicting Savimbi along with the UNITA flag and, for whatever reason, a tiger). According to my research, a millionaire philatelist in Florida who sympathized with UNITA helped mint and market these stamps starting in February 1986. For this and other unusual forms of "rebel governance," see my book. As my article shows, beyond UNITA many other rebel groups conducted wartime diplomacy. Here is a photo of young Mari Alkatiri, an exiled rebel diplomat representing Timor-Leste, pleading for independence of the territory from Indonesia before the UN Decolonization Committee ("Fourth Committee") in October 1980. Also presenting a case for independence during the same session was a rebel diplomat from Western Sahara. Alkatiri became the first prime minister of independent Timor-Leste in 2002. Western Sahara, meanwhile, remains on the list of UN Non-Self-Governing Territories.